Apple butter is a perfect way to enjoy the fantastic taste of apples all throughout the year. 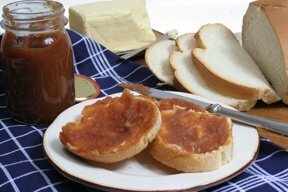 Homemade apple butter is great spread on toast, English muffins, and bagels. You can also add it as a topping choice when serving pancakes or waffles. Find everything you need to know about apples and see our apple chart to find out the best way to use the different varieties. Step-by-step instructions on how to make applesauce and how to freeze it so you can enjoy it all year round.